For the past 50 years, Murray Goldman has been a builder of business and an outstanding community contributor in British Columbia. He built a men’s retail clothing business in Vancouver which eventually became one of the best known retail chains in B.C. His work in the Jewish community includes serving on the boards of the Schara Tzedeck Synagogue and the Louis Brier Home for the Aged. He has been a member of the Variety Club of British Columbia since 1967. The enthusiasm with which he enters any project is well known throughout the community and his hallmark of success in all activities. 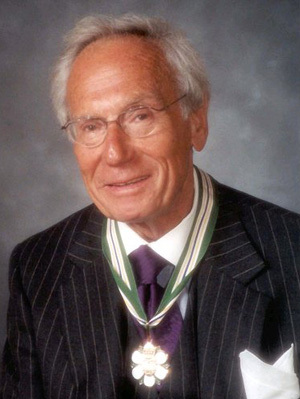 Murray Goldman is best known for his involvement in Big Brothers of British Columbia. One of the founding members and original directors, he has positively influenced the lives of thousands of young boys in British Columbia. He has worked tirelessly for this organization by single-handedly bring dollars, volunteers and awareness of Big Brothers by his own unique style and efforts. After 40 years, Murray Goldman is still active with Big Brothers and serves as Honorary Chair. He is a truly caring Canadian who has succeeded through hard work and concern for others — serving his community and country unselfishly for many years.